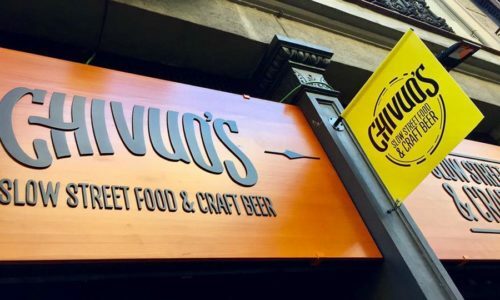 Chivuos is a popular restaurant in Barcelona, ​​famous for its delicious street food and the extensive selection and quality of its beer. The formula is simple but it is undoubtedly very effective, becoming one of the busiest places in Barcelona’s Eixample. Chivuos pays tribute to ¨LA CHIVA¨, a symbol of knowledge, experience and wisdom. The employees of the establishment start every day with the illusion of being able to make an honest product, treated as it deserves. Our client was looking for a special trucker cap model to customize it with the company logo. Our experience in personalised caps made us define that the best technique for this type of product was without a doubt embroidery. The trucker cap model used was the Beechfield B640. For this case, the customer was looking for a black cap with white embroidery on the front, at the maximum size allowed, this product is 6cm to 7cm high. The embroidered caps give a great visibility to your brand and allows to differentiate the staff from the clients when the premise is full. At Garment Printing we know the best ways to personalize headwear. Discover our extensive range of high-quality personalized embroidery, screen printing or transfer. We know that creating personalized caps is a fantastic way to advertise your brand, company or event. After doing some embroidery tests and thread colors, the client has decided to choose white embroidery on the caps. This type of customization is the one that provides greater resistance to washing and everyday use. It also generates a more professional and detailed look. As you can see in the photos the result was excellent, we provided the product such as it has been shown in the visual test. The client was very satisfied with the delivered product and we keep in touch with them for future orders. At Garment Printing and we help companies, events and organizations to show off their brands with personalized and quality clothing, such as: personalized t-shirts, hoodies, sweaters, jackets, polo shirts, personalized tote bags and almost any other textile printing element that you imagine.